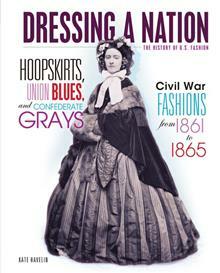 This book covers the clothing, accessories, and fashions of the American Civil War (1861-1865). This title explains how fashions of the mid-nineteenth century reflected U.S. society of that era and includes information on slave and military dress. What would you have worn if you lived during the Civil War era? It depends on who you were! For example, upper-class women wore tight corsets, bustles, and wide hoop skirts to fancy balls. The layers weighed almost 30 pounds (14 kilograms)! For everyday, whether at home or nursing soldiers, women put on multiple layers of simple fabrics. Some daredevils sported women's trousers-called Bloomers-to make a statement on women's rights. Read more about wartime fashions of the 1860s-from ankle boots to parasols and tiaras-in this fascinating book! Kate Havelin has written more than a dozen books for young people, including biographies of Queen Elizabeth I, Ulysses Grant, and Che Guevara. The Amelia Bloomer Project included her Victoria Woodhull: Fearless Feminist in its recommended list of books. Havelin has also written two trail guidebooks for adults, Minnesota Running Trails: Dirt, Gravel, Rocks & Roots and Best Hikes of the Twin Cities, both of which received awards from the Midwest Book Awards. When she's not writing, she likes to read, run, hike, kayak, ski, or snowshoe. Havelin lives in St. Paul with her husband and two teenage sons.